The deed was finally done. 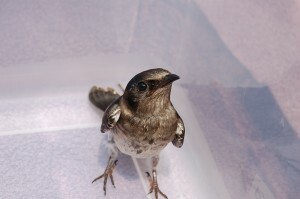 The HY purple martin that was found at the Davie roost was peacefully euthanized over the weekend. With a broken shoulder and no hope of rehabilitation he was put down. Then yesterday on a non purple martin note, one of my gouldian finches was on the verge of death. Egg bound and with her eyes closed, I picked her up off the cage floor and after almost 20 minutes of warm steam, mineral oil and gentle massage, she expelled the egg. I totally blame myself as I had not been giving her egg shells to eat. Today she is a bit greasy looking but chirping and flying about her cage. I even watched her take a bath. At the colony here, the purple martins were busy dive bombing a large hawk that was painting lazy circles directly over the housing. I am sure it was on the look out for fledglings. The heat index was well into the hundreds. 110 in some locations and was just miserable. I stayed in and watched from air conditioned comfort. 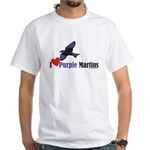 As you know, on Saturday I dropped off a HY purple martin that I found at the Davie Roost. The apparent trauma of a tree collision (?) the martin was unable to fly and seemed to be slightly uncoordinated. I brought him to the Folke Peterson Wildlife Center where he was given some medications and observed. Today I received bad news. Apparently after he failed a flight test, he had an X-ray taken and it was found that he has a crushed shoulder. Unable to be fixed surgically, he is doomed; and though calm and comfortable, his days are numbered. I am upset at the news and so looked forward to releasing him back at the roost to join his comrades. I am so sad to think that he will meet the same fate as those that were littering the floor. Another fallen martin, another statistical failure and another purple martin that will never fly across the Equator. I will tell you when his hour comes. The colony remains busy in the morning but quiet as evening approaches and I am looking forward to going to the roost again. I have been unable to locate any raccoon repellent at the local Lowes, hardware store, feed store, Dicks sporting goods or Bass pro shop. The ideas I have received include moth balls, metal flashing, Vicks vapor rub, large cat (like lions and tiger) feces, traps and chaining a large dog to a tree under the colony. Unfortunately, I have been unable to come through on many of those ideas. The folks at one animal removal service told me that since the raccoons have discovered the richness of the roost, that a chemical/scent repellant will be useless. With everything going on I can’t believe I found time for a nest check. After crunching some numbers, I am very happily surprised. I had doubted my ability this year, for my colony to achieve the 100 mark. But reach it it has! With two nests still with eggs and eight nests still with young, my colony has fledged 103 young purple martins! 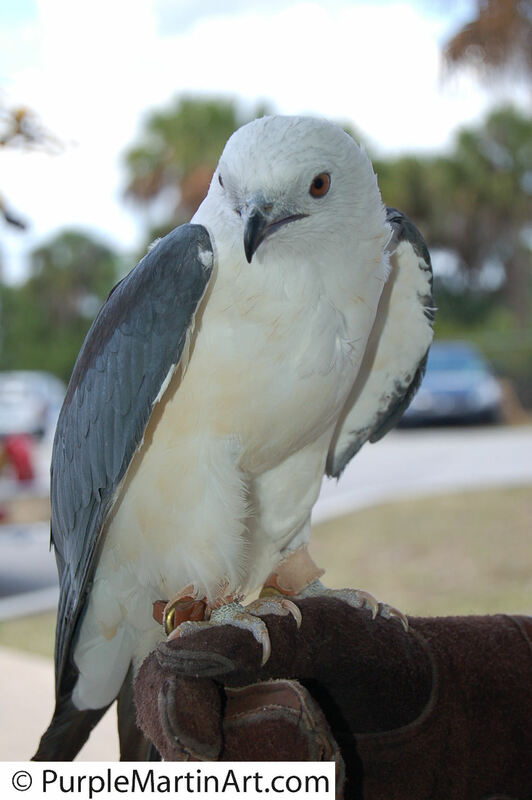 Remember, the Folke Peterson Wildlife Center “Wild Wednesday” is only 2 days away. Hope to see you at 7pm on June 17, 2009. The day started out hot and steamy. A very nice lady, Karyn L., I met in Titusville at the 2009 Space Coast Birding and Wildlife Festival, braved the heat to make a second trip to my house to take some pictures of my martins. Of course I am ever proud of my thriving colony in my backyard, so of course she is always welcome. I then had to make last minute preparations for a 1pm presentation on Purple Martins at the Folke Peterson Wildlife Center. The center was having its RescueFest. A fund raiser to attempt to help save the center during our challenging economic times. Friday night was an adults only event with wine tasting, silent auctions and I heard, great fun was had by all. Saturdays turn out was modest and the highlight for me was meeting a Swallow-tailed kite up close and personal. The girl holding the kite told me, erroneously, that they are exclusively insectivores. I told her of the kite who snatched a dove nestling out of a nest in a tree in the neighbors yard and I had the feeling she thought I was quite wrong. This evening I even double checked my facts and according to my trusty Audubon Field Guide, swallow-tailed kites eat insects and “snatches lizards off the trunks of trees.” So from a lizard to a naked nestling, I don’t consider it a far stretch. I also saw, tonight at dusk, for the second time in my life a Common Nighthawk. The first time I saw one was last week and I did not know what it was. It was about 6pm and the martins were feeding high above the house and I noticed a bird similar in wing shape but a bit larger and with white wingbars. Its flight was distinct and much different than I had ever seen. Described by Audubon as “fluttery” I though it more pulsing yet irregular. Tonight I heard its distinct call and looked up searching. Knowing that there was enough light to catch a view and sure enough, high above calling its buzzy single note. My husband, as usual, thinks I am quite the “bird nerd” and I proceeded to try and convince him of the importance of this event. He was non-plussed. The Common Nighthawk is probably a bird that many of you have heard but never noticed. 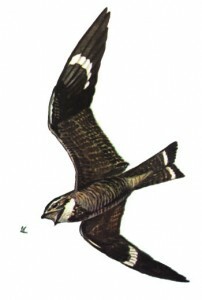 In the nightjar family, Nighthawks are related to whippoorwills and are equally odd looking. I always hear them at night in the parking lots of Kmart and the like. Never able to see them due to the darkness, I was always intrigued by the nasal “peent” . For many years I though the sound was that of some kind of frog or insect. Next time you go to the local super center at night, listen for the Common Nighthawk.